I heart beef, but seldom thought of making any dish with beef cheeks. The recipe of the slowly braised beef cheek that Trissa found in the Movida Rustica cookbook really got me thinking, “Hm…I should give it a go.” When I asked my daughter, “Do you want to try beef cheeks?” she instantly raised her eyebrows. “Beef cheeks? How to cook?” I know her very much. The two words “beef cheek” absolutely got her interest. With a bit concern, I didn’t promise her to make this dish because I was worrying that I couldn’t get all the ingredients, as I hadn’t seen any beef cheek here before. Well, I might haven’t noticed if there’s any. To my surprise, I found three packets of beef cheek at Woolworths the following day. No need for second thought, I took two of them. I, myself, felt the end result was very satisfied. My daughter asked me to save a big portion for her next day’s lunch. 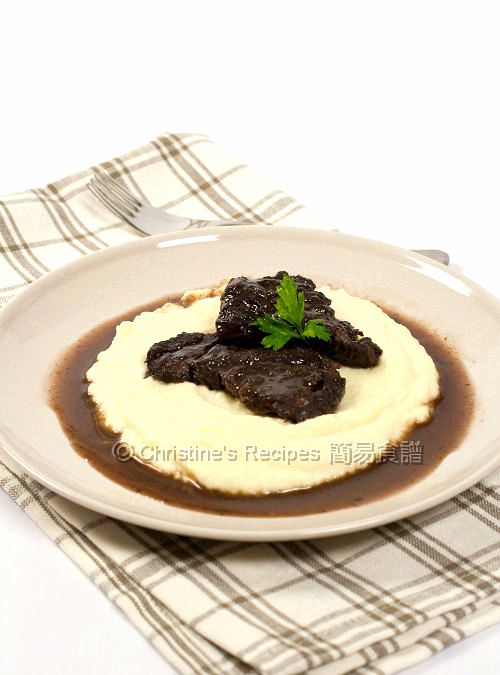 The super tender, melt-in-mouth beef cheek on the creamy cauliflower puree was really a big hit in my family. Trim the beef cheeks to neaten them up and remove any new sinew and silver skin. Season well. Add the remaining olive oil, then add the carrot, garlic, onion and saute over high heat for 12 to 15 minutes, or until well browned. Stir in the sherry, wine, bay leaves, thyme, sea salt and 500 ml water. Reduce the heat as low as possible, add the beef cheeks, then cover and cook for 3 to 4 hours, or until the cheeks are beginning to fall apart. The sauce from the beef cheeks should by now be reduced and glaze like. It if needs further reducing, remove the cheeks from the pan, cover with foil to keep them warm, and simmer the sauce over high heat until nicely reduced. Strain the sauce through a fine sieve and return to the pan; gently reheat the cheeks in the sauce if necessary. Serve the cheeks and their sauce on warm plates with the cauliflower puree. Now, I really have to make this soon! Looks absolutely delicious, Christine! Hihi! Looks yummy! Have tried beef cheeks before, but never cooked it myself? Couldn't quite see on the picture, was it expensive? The combo looks great and I love your plating. I'm asking myself if I have ever eaten a cut from cow's head : ). Beef cheek is not expensive here. 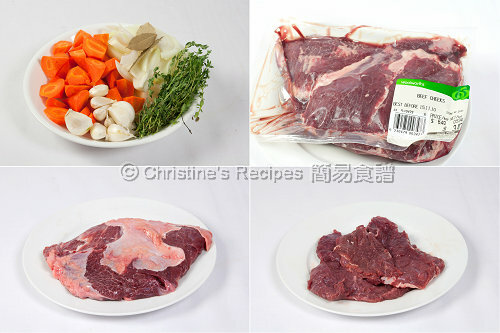 I got it only at around 6/kg, compared to other cuts, it's very cheap. Christine! You finally made it - I am so glad you managed to find the beef cheeks and of all places as Woolies! I love the rich glaze on the meat! By the way, I didn't realize you have a Chinese site as well - how can you manage to maintain both? You are a wonderwoman! I've never had beef cheeks but your plate sure looks delicious!! Beef cheeks are so tender. I never cooked them before but think I tried something similar. This dish is star-quality! Good looking dish and I like the picture. The colours blend very well! Looks absolutely delicious! I might have to try it with a different cut though as the bf thinks the tender beef cheeks taste slimy, but the sound of a Pedro Ximenez sauce sounds divine! I think beef shink will work for this recipe too. Guess it needs less cooking time. Think I'm gonna try this with beef shin. What exactly does one garlic bulb (halved) mean? Can the beef be cooked in a wok? The beef cheek takes a while to get cooked and softened. So if using a wok, you might need to top up the water a few times during the slow-cooking process. It all depends on how hungry the people who you're feeding are. You might check the weight on the packaging first. Then you can calculate how many you need.